The progress of a country is linked with the health of it's people. Health is one of the prime parameters to judge the progress and development of a country. India has been developing at a rapid pace but the growth in the Human development Index has been really slow. Inclusive Growth - With Indians becoming more aware about their roles, responsibilities and their human rights, now the focus has shifted from just economic growth towards a growth which increases our human development Index. This Inclusive growth refers to providing basic facilities for living to everyone in this country. The health dimension is assessed by life expectancy at birth component of the HDI is calculated using a minimum value of 20 years and maximum value of 85 years. The education component of the HDI is measured by mean of years of schooling for adults aged 25 years and expected years of schooling for children of school entering age. Mean years of schooling is estimated by UNESCO Institute for Statistics based on educational attainment data from censuses and surveys available in its database. Expected years of schooling estimates are based on enrollment by age at all levels of education. This indicator is produced by UNESCO Institute for Statistics. Expected years of schooling is capped at 18 years. The state of being free from illeness or injury. Conditions or practices conducive to maintaining health and preventive disease, especially through cleanliness. The word sanitation, derived from the latin word "sanus" meaning sound or Healthy. Sanitation is the hygienic means of promoting health through prevention of human contact with the hazards of wastes as well as the treatment and proper disposal of sewage or wastewater. Hazards can be either physical, microbiological, biological or chemical agents of disease. Hand washing with soap, particularly after contact with excreta, can reduce diarrhea (diseases) by over 40 per cent and respiratory infections by 30 per cent. Diarrhea and respiratory infections are the number one cause for child deaths in India. Hand washing with soap is among the most effective and inexpensive ways to prevent diarrhea (diseases) and pneumonia. With 594 million people defecating in the open and 44 per cent mothers disposing their children’s faeces in the open, there is a very high risk of microbial contamination (bacteria, viruses, amoeba) of water which causes diarrhoea in children. Children weakened by frequent diarrhoea episodes are more vulnerable to malnutrition and opportunistic infections such as pneumonia. About 48 per cent of children in India are suffering from some degree of malnutrition. Diarrhoea and worm infection are two major health conditions that affect school age children impacting their learning abilities. Adequate, well-maintained water supply and sanitation facilities in schools encourage children to attend school regularly and help them achieve their educational goals. Inadequate water supply and sanitation in schools are health hazards and affect school attendance, retention and educational performance. Women and girls face shame and a loss of personal dignity and safety risk if there is no toilet at home. They have to wait for the night to relieve themselves to avoid being seen by others. • India is home to 594 million people defecating in the open; over 50 per cent of the population. • In Bangladesh and Brazil, only seven per cent of the population defecate in the open. In China, only four per cent of the population defecate in the open. • 88 per cent of the population of 1.2 billion has access to drinking water from improved sources in 2008, as compared to 68 per cent in 1990. • Only a quarter the total population in India has drinking water on their premise. • Women, who have to collect the drinking water, are vulnerable to a number of unsafe practices. Only 13 per cent of adult males collect water. • Sixty seven per cent of Indian households do not treat their drinking water, even though it could be chemically or bacterially contaminated. • According to the Public Health Association, only 53 per cent of the population wash hands with soap after defecation, 38 per cent wash hands with soap before eating and only 30 per cent wash hands with soap before preparing food. • Only 11 per cent of the Indian rural families dispose child stools safely. 80 per cent children’s stools are left in the open or thrown into the garbage. • Only 6 per cent of rural children less than five years of age use toilets. • Source water treatment by 11 per cent. What we can do to change our Country ? I personally feel that small changes by every individual can accumulate and create a great change in the society. If every individual make it a point to work towards creating a better country then there will nothing which can stop us from achieving our goals. We are country with more than billion people and to give proper facilities to every person we need lots of work. If we leave all the work for the government then it may take years for this change to come. We as citizen should also play an active role in bring change to the society. 1. Be the Change - I feel the change in the society to start from one's own house. We should start by inculcating proper hygeine and sanitation practices in our homes and offices.We should emphasis on the use of washing hands with soaps and not urinating in open spaces. 2. keep surrounding clean - Many people have the habit of keeping their house clean but they end up throwing garbage and other dirt outside their home. One should remember that the whole country is our home and we should try to keep our whole country clean not just our own houses. If our surrounding and roads are not clean then we will fall prey to diseases automatically hence cleaning our surrounding is very important. So, all my blog readers please don't throw garbage in your neighborhood and don't litter or urinate in the roads and foot paths. This small thing can bring huge change in our society. 3. Spread awareness - I feel it's not just about us cleaning the society, we need every person to join us in this initiative hence try and promote this #SwachIndia initiative and spread it to as many people as possible. The more people you can reach, the more number of people you are creating who are going to help make our country better. 4. Volunteer - If possible, volunteer with any group or ngo to promote and clean cities and neighborhood. These days many ngo's are working towards creating a better and healthy India. We can devote just few hours every week towards these cleaning drives to help our country become a clean and healthy country. 5. Donate - If possible, donate to these causes and the to groups who are working towards creating better facilities for the poor and the down trodden. These facilities just don't help the poor but in turn make our society a better place to live and we will be passing a better country to our next generation. 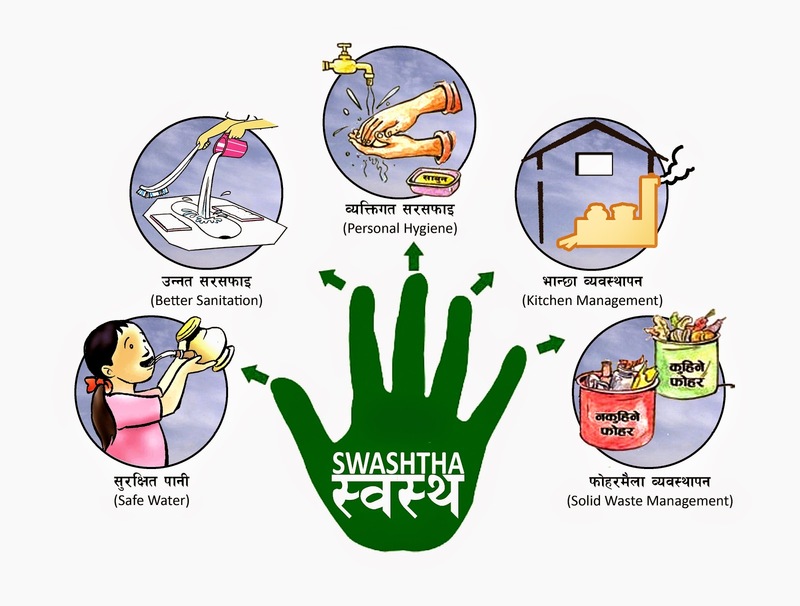 I feel government is already trying to do a lots of work towards providing better hygiene and sanitation facility but I think being aware about few very important aspects where government needs to work will help us to force government to implement and govern better, we all should be a partner in governance. Toilets in schools - I think toilets in school is one of the most important aspect our counrty should work on as children needs the most care as they are most likely to fall prey to these diseases. Open defecation - open defecation creates lots of problems. It spreads many bacteria and disease causing germs. The surrounding area gets polluted. The air is the area gets dirty and even the local water bodies get affected and become unsuitable for use. Public Toilets - I feel lack of public toilets create a lots of problem. Most of men urinate in open spaces which make those places a hub for diseases. Further women face greater problems as they can't go to toilet anywhere and this may cause health issues for them. UNICEF INDIA and UNDP. Image from this site. Wow, it is a detailed and informative post! Let's hope, #SwachhIndia becomes a reality soon. Very informative post. But what do we do about the practicality? A mother can be the best teacher, if she leads by example. But who will teach the mother? Literacy has nothing to do with education - I have educated neighbors leaving garbage open thru the night. No cover, no container.